We’re in April, and you know what that means. 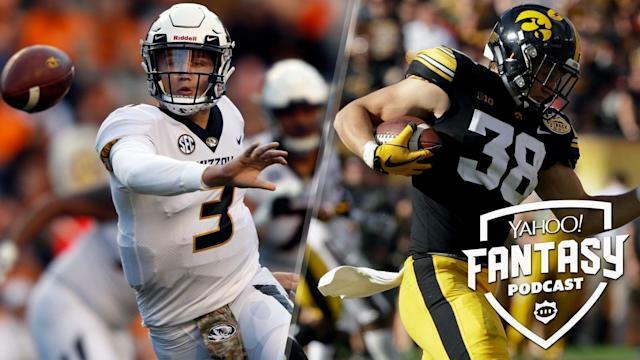 It’s time to talk the 2019 NFL Draft, and Liz Loza and Matt Harmon are more than ready in this week’s fantasy football podcast. Before they get into the nitty-gritty of it all, they circle back to last week, to discuss the Jordan Howard trade from the Bears to the Eagles (which Liz and Matt pretty much predicted, btw) (3:20). They also discussed the prospects of the Rams backfield potentially changing last week, and lo and behold, C.J. Anderson signed with the Lions (7:20). Will he be a factor in Detroit — and potentially a thorn in Kerryon Johnson’s fantasy owners’ sides? Now that we’ve gotten that out of the way, let’s focus on the draft. Liz and Matt breakdown the top tight ends and quarterbacks set to join the NFL. The TE class is led by T.J. Hockenson and Noah Fant (33:55), while the first QBs expected to be drafted are Kyler Murray and Dwayne Haskins (in no particular order) (11:00). Who will end up in the best situation — and who will provide the most fantasy impact? Don’t forget to leave a voicemail on a future episode of Liz and Matt’s Help Line by calling (888) 85-YAHOO or (888) 859-2466.